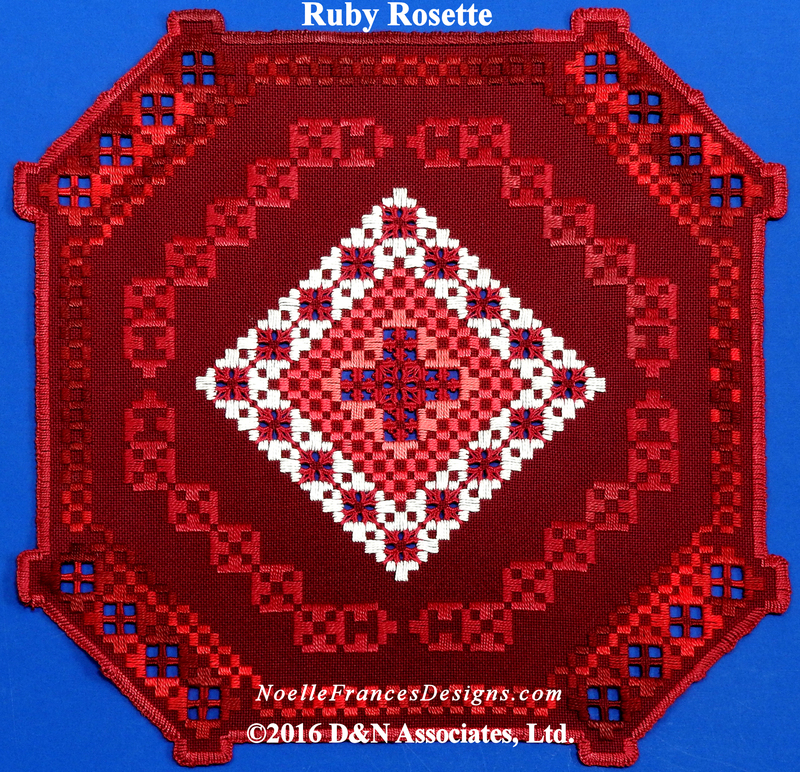 Ruby Rosette design is a counted Hardanger needlework embroidery presented within a 50 page booklet available in printed and Kindle formats. This design contains openwork, Hardanger satin, Kloster blocks, rosette, weaved bars and picot stitches. Details for working the rosette stitch are contain within the booklet. Ruby Rosette design is 293w by 293h, slightly under 15 inch square on 20 count. 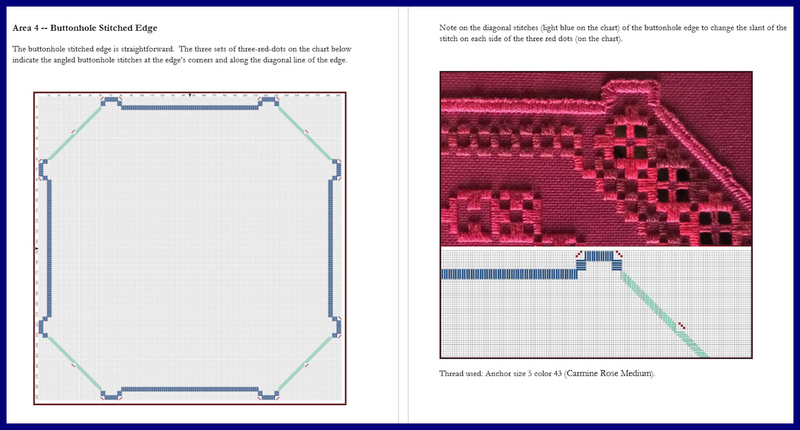 Ruby Rosette design is easy to stitch when you follow my booklet’s numerous pages of zoomed-in charts and photos. My booklets are divided into sections that discuss the main pattern parts of each design, present photos and graphed charts in color and close-ups so you can see the details. 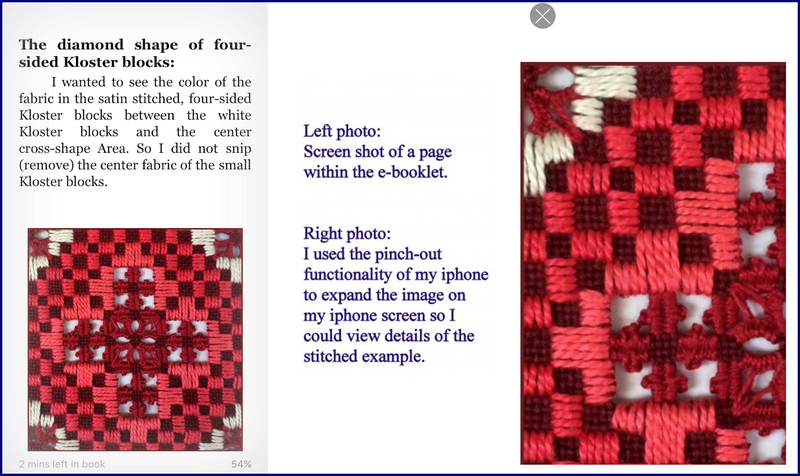 Within the e-book format you can expand the charts and photos throughout the booklet to view details down to individual stitches. My booklet Ruby Rosette is 50 pages in length and is offered in e-booklet format and printed as a 8 by 10 inch paper bound booklet. Click the below photo for ordering or to access the Look Inside feature to view a few pages of the booklet for the Rudy Rosette design.